A chill is in the air…Pumpkings are stirring…don’t look now, Terrarians, but something is creeping up on you! No, it’s not a Zombie or Blood Crawler….it’s the Second Annual Re-Logic Halloween Contest! Our inaugural contest from last year was a smashing success, with pumpkin carving and costune entries that quite frankly blew our minds – and expectations – away! You can check out last year’s Pumpkin entries on the Terraria.org Media page. It is with great anticipation, therefore, that we announce this year’s contest. For this year, we decided that with all of the additional in-game building tools now available across the Terraria universe (PC/Console/Mobile) due to various updates, the contest will focus on in-game builds. We hope this will be more accessible and thus pull in Terrarians from across the player base. We will have three categories – each with its own set of winners – aligned to the three core platforms of Terraria: PC, Console, and Mobile. Your name (or an alternate name) added to the list of NPC names in Terraria! Official Terraria Now Available on GOG! Today, we are excited to announce that Terraria is now available on GOG! For those that are unaware, GOG is an online game & movie distribution service. Games purchased via GOG are DRM-free, making this offering the first online DRM-free version of PC Terraria made available. Terraria on GOG will sell for the usual price of $9.99, which will buy you the game as well as both volumes of the Official Terraria Soundtrack! In honor of the GOG launch, however, Terraria on GOG is currently on sale for $2.50 - a savings of 75%! This sale will run for the first four days.. The launch sale is now over, Terraria remains available on GOG for the normal price of $9.99. So, if you don't currently own a copy of PC Terraria - or you've always wanted a DRM-free version - this is your chance to take advantage of an awesome deal! Thanks for your continued support, and we look forward to continuing to bring awesome news and content to the community in the months to come! Hello everyone, and welcome to the new forums! QuackersDelta, the Creation Compendium Organiser has given me permission to port all the old CCs from Terraria Online over here. There are at least 240 images, so unfortunately they will be spread over multiple posts. Sorry for the bad formatting (especially spoilers!) this has been through TO, and TCF. Sadly, all youtube videos have been removed, as they only produced error code. But first, AyeAye12’s introduction at the start of the CC: What is the Creation Compendium? “Hi, and welcome to the Creation Compendium! AyeAye 12 has since left the creation compendium, and It’s now run by QuackersDelta. Now, the compendiums! All 240 Creations! Hi, and welcome to the new Creation Compendium! But wait, what is the Creation Compendium? Why, it is the conglomeration of user-made art related to Terraria and a theme suggested by the community and/or my mind. It was originally hosted by Confuzzlydyma, before life sucked her away from the Internet. The next heir to the project was Kane, before he stopped thanks to a lack of entries. Official A Lively World - Terraria 1.3 Spoilers & TCF Launch Event! First, we would like to thank each of you for your patience and support while we worked to get our brand new website and Official Forums off to a fantastic start. We really hope that each of these will enhance your Terraria experience! That said, we certainly know that everyone has been anxiously awaiting any word – or even a whisper - around the goodies that await everyone in the upcoming Terraria 1.3 update. Well, Terrarians, you shall wait no more, as we are ready to reveal another round of 1.3 information! 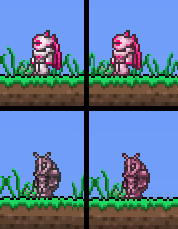 This time, we wanted to share some changes that will help make Terraria feel more "alive" along with a few random tidbits that we think you will enjoy. We are still going to hold off on sharing the coolest stuff – we may share some of this in the coming weeks, but we also want to stay true to our philosophy of letting our players discover things on their own. Terraria NPCs have always been helpful – and witty – but limited in what they could do. 1.3 brings a number of NPC animation changes that are intended to help bring them to life and make them feel more like an interactive part of your world. While we were at it, we decided to go ahead and give our crew of NPCs a visual "makeover". Official Welcome to Terraria Community Forums! Happy TCF Launch Day Everyone! 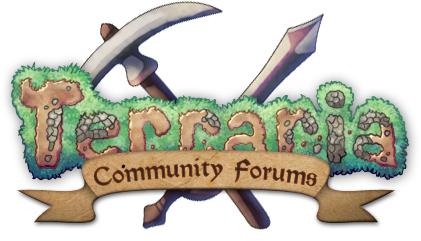 Well, after a few months of waiting - coupled with the blood, sweat, and tears of the forum development team – the time has finally arrived to officially open up our new forums to the Terrarian Community! The entire team sincerely hopes that this new location will build upon the solid foundation built over the past few years and foster growth/evolution of the community that was previously impossible – or at least very difficult. We have tried our best to listen to community feedback – leveraging what worked on TO, fixing what did not, and adding additional features that haven’t been available to Terrarians until now. We are confident that we hit on these goals and look forward to seeing how each of you will react to our work. Just as the 1.2 Update “raised the game” for Terraria, so will the launch of our new site and forums for our community. A team of passionate and dedicated individuals has worked tirelessly behind the scenes – listening to Community feedback, exploring the available technical/feature options, and aligning to Re-Logic’s vision of things – towards the building of a foundation for our new community. We are absolutely thrilled with how this turned out and feel that we are giving our first Official Community a fantastic beginning! That said, we know that nothing is ever perfect, so we look forward to working hand-in-hand with our fans to continue to evolve our offerings here on TCF. Ultimately, the community is YOU and this site exists for YOU. As such, we are counting on YOU to continue to tell us what we can do to give each of you the best possible Terraria Community experience possible! Official The New Terraria Website is Now Live! Re-Logic is very excited to announce that the new Terraria.org is now live! This was essentially a full rebuild from the ground up, and – much as the 1.2 update redefined the in-game experience for our fans – we hope that this will provide a more immersive and integrated community portal moving forward. Parallel to this will be our own set of forums, and you can find out more in regards to that on the front page of Terraria.org starting today. We are confident that the substantial changes will be immediately obvious and sincerely hope that the community appreciates the hours of hard work that our amazing duo of Skiphs and Crowno put in. We are quite proud of the new face of our web presence – which we feel is worthy of the Terraria name! In the past, Terraria.org was used primarily for providing basic information about the game and as the place to obtain the official Terrara Server software. Moving forward, not only do we plan to continue to provide that information on Terraria.org, but we also plan to utilize the new site as an additional means (on top of regular interactions in our community forums) to share news surrounding Terraria and other Re-Logic projects. We hope you will take some time today to check out the brand new Terraria.org – and while you are there, don’t forget to read up on the plans for the upcoming forums. Official First 1.3 Spoilers: Rulers & Progress Bars to Dye for! Official 2015 Official Terraria Calendar now Available! Re-Logic is happy to announce that the Terraria 2015 calendar is now available on Amazon! Thank you Suweeka for your amazing art! Quick feedback: For 2016 would you like to see high res, pixelated, or both? Djinn's Curse is an underrated Accessory.